Finally, after what seems like an eternity (at least since quitting my job), I’ve landed in Cairo and I’m back in travel mode. The plane trip was odd. I started doubting if I really wanted to do the extended travel thing again. The Lonely Planet book on Egypt wasn’t much help, talking about soaring temperatures, touting locals and dodgy water. But once I’d landed and was taking a taxi into town, all that evaporated and all those good feelings came flooding back. New places, new ways of living and most importantly, new kinds of food to eat! It’s only at the end of day 2 now and I’m having so many flashbacks to Vietnam (the first country I started with last year). The chaotic traffic, the heat, every second person selling something and the two tiered pricing system for tourists – it’s all so similar, even down to the little things - like a vendor selling BBQ’d corn cobs or a mango juice stand. . I could theorise on the countries similar economic situation coupled with large levels of tourists, maybe the similar climate has something to so with it – but I didn’t do Arts at Uni for a reason and I’m not going to start writing essays now. Cairo, to put it nicely, is showing its age. It’s far and away the most polluted city I’ve ever seen, urban planning is fiction, with a sprawl that goes on as far as the eye can see and all the buildings give that feeling that the city is one minor earth tremor away from becoming a massive pile of rubble. Although, considering this civilisation is a couple of thousand years old, you can forgive the place for showing its age a little. I’ve spent the last couple of days doing the typical tourist thing. 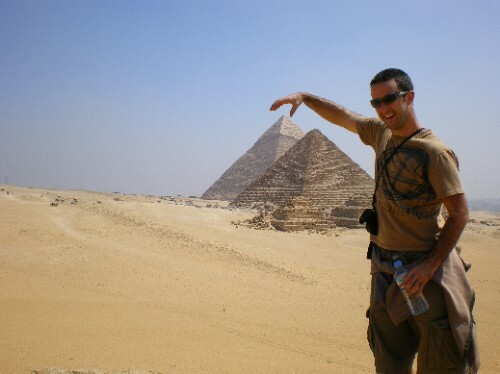 The Pyramids on the Giza Plateau were, as expected, amazing. I went down inside Khufre, the smaller of the big 2 (only 300 people a day are allowed in the Wonder, Khufu and queuing begins early). Pretty awe inspiring to actually be in such an iconic structure. I tried not to think of the volume of people who died during its construction (and there’ll be no OH&S jokes here). Yesterday I went to the Egyptian Museum, a two story building filled to the brim of Pharonic artefacts. The volume of objects that have been uncovered out in the desert is phenomenal. Seeing the three sarcophagi that the kings were buried, and the four shrines that fitted in each other like Russian dolls (all gold plated) is just surreal. It was a real blast to see King Tut’s gold head dress (either 11kg or 110kg depending on what you read), it restirred all the interest I had in Ancient Civilisations I had in Primary School. I’ve got two more days in Cairo, I’ll be exploring different sections of the city and after that will head South to ‘Upper Egypt’ for more tomb raiding and a Nile cruise that I’ve heard lots of good things about. After that if I have time I’ll head to the Red Sea for a spot of snorkelling and maybe a quick jaunt up Mt. Sinai. Hope you’re all doing well at home, believe me, I’d swap the sub-zero temperatures for the god awful heat I’m in at the moment. Take care now!